Comm Eye Health Vol. 27 No. 88 2014 pp 74 - 75. Published online 01 April 2015. Refractive error affects people of all ages, socio-economic status and ethnic groups. The most recent statistics estimate that, worldwide, 32.4 million people are blind and 191 million people have vision impairment.1 Vision impairment has been defined based on distance visual acuity only, and uncorrected distance refractive error (mainly myopia) is the single biggest cause of worldwide vision impairment. However, when we also consider near visual impairment, it is clear that even more people are affected. From research it was estimated that the number of people with vision impairment due to uncorrected distance refractive error was 107.8 million,1 and the number of people affected by uncorrected near refractive error was 517 million,2 giving a total of 624.8 million people. Despite being one of the more easily corrected conditions resulting in vision impairment, uncorrected refractive error still remains a significant cause of vision impairment globally. A number of factors contribute to this situation: a lack of trained eye health workers to address the current refractive challenges, poor integration of refractive services into existing eye health services and a limited number of good quality training programmes. The World Health Organization’s Global Action Plan for 2014 to 2019 has identified human resources for refractive error as a priority in reducing avoidable blindness globally. 7, 8 Current challenges include the uneven distribution of refraction training institutions and a lack of standardisation, which makes it difficult to maintain the quality of services. In some countries, competing eye health priorities also mean that providers sometimes neglect refractive error services. In many low- and middle-income countries, it is necessary to provide refractive services at all levels of the health care system, especially at primary level, where services are provided in the community. Successful services have an integrated team approach, with a clear referral pathway and a defined scope of service at each level. For example: screening/case finding at community level, presbyopia or basic refraction services at primary or community health centre level, specialised services at secondary or district level, and pre- and post-operative refraction services at tertiary or regional level. 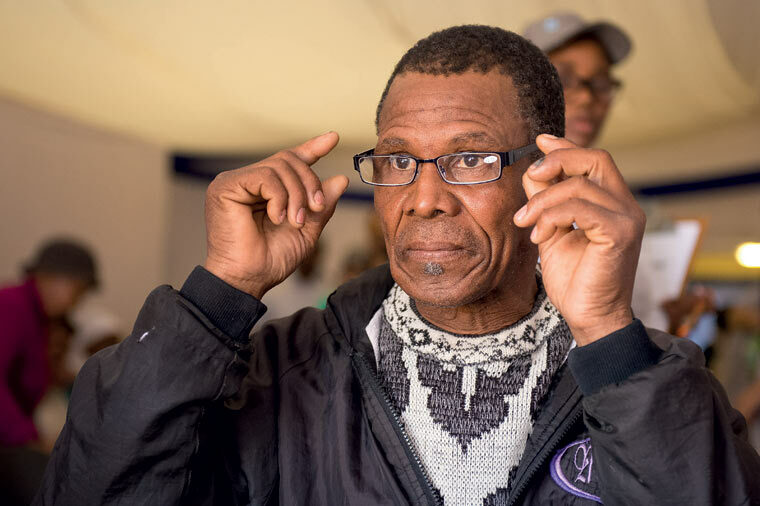 Social enterprise (SE) solutions provide refractive error services while at the same time alleviating poverty and providing employment opportunities. SE initiatives are meant to complement existing eye care delivery systems, and can take many forms. A vision centre model charges those who can pay and uses this income to subsidise services for the poorest of the poor and is usually run by NGOs or in partnership with the public sector. A social franchise model allows entrepreneurs to be supported to make affordable frame and lens packages available in underserved areas. Delivering comprehensive, accessible eye care to communities means that the necessary equipment and space needs to be allocated for services to be delivered and an affordable spectacle supply chain should be in place. In some cases, refractive services are provided, but an inadequate supply of spectacles makes these services irrelevant as people still have to live with uncorrected refractive error. It is evident that there is still much that should be done to alleviate the problem. By developing evidence through research initiatives (e.g. determining the regional and country-specific prevalence of uncorrected refractive error or mapping human resources), country-specific solutions can alleviate the problem in a comprehensive and coherent manner. Research data on the impact correcting refractive error has on people’s education and socioeconomic status will provide the information needed for successful advocacy efforts. 1 Bourne RA, Stevens GA, White RA, Smith JL, Flaxman SR, Price H, Jost JB, Keefe J. et al. Causes of vision loss worldwide, 1990-2010: a systematic analysis. Lancet Global Health. 2013: 1(6): e339 –e349. 2 Holden BA, Fricke TR, Ho SM, Schlenter G, Cronje S, Burnett A, Papas E, Naidoo KS, Frick KD. Global vision impairment due to uncorrected presbyopia. Archives of Ophthalmology. 2008 126: 1731–1739. 3 Adigun K, Oluleye TS, Ladipo MMA, Olowookere SA. Quality of life in patients with visual impairment in Ibadan: a clinical study in primary care. Journal of Multidisciplinary Healthcare 2014:7 173–178. 4 Naidoo KS and Jaggernath J. Uncorrected refractive error. Indian Journal of Ophthalmology. 2012 60(5):432–437. 5 Vu HT, Keeffe JE, McCarty CA, Taylor HR. Impact of unilateral and bilateral vision loss on quality of life. Br J Ophthalmol. 2005;89(3): 360–363. 7 Fricke TR, Holden BA, Wilson DA, Schlenther G, Naidoo KS, Resnikoff S and Frick KD. Global cost of correcting vision impairment from uncorrected refractive error. Bulletin of the World Health Organisation. 2012 90:728–738.